CHICAGO, ILL. – The National Basketball Retired Players Association (NBRPA), the official alumni association for former NBA, ABA, WNBA, and Harlem Globetrotters players, will bring its successful Full Court Press: Prep for Success youth basketball and mentoring program to more than 15 cities this year in continuance with its partnership with the Jr. NBA, Police Athletic/Activities League (PAL) and Leadership Foundations. 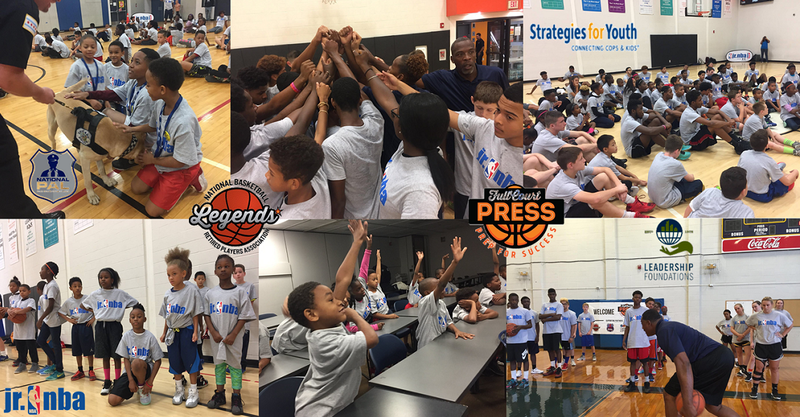 The Full Court Press: Prep for Success is a single-day youth basketball and mentoring clinic for underserved boys and girls, ages 8-18, held in cities across the United States and abroad. The program is designed to support the development of participating young people both on-and off-the-court through basketball instruction, mentoring roundtables and an innovative life skills curriculum. The Jr. NBA, the NBA’s youth basketball participation program, has a partnership network that is comprised of youth basketball programs of all NBA, WNBA, and NBA Development League teams as well as elementary and middle schools, military installations, and longstanding community partners. The Full Court Press initiative features the Jr. NBA curriculum that teaches the fundamental skills of the game in an effort to help grow and improve the youth basketball experience for players, coaches, and parents. International missions have included events in Israel, Cuba, and Haiti. The touring program visits at least 15 cities annually and includes former professional basketball players as coaches and discussion leaders in each session. The off-court curriculum address mentoring, leadership, and other topics relevant to each community and is led by community leaders from Leadership Foundations, Strategies For Youth, and the National Police Athletic/Activities League (PAL). The program reflects the NBA Family’s ongoing commitment to creating stronger, safer communities for all. The Jr. NBA presented by Under Armour is the league’s youth basketball participation program that teaches the fundamental skills as well as the core values of the game at the grassroots level in an effort to help grow and improve the youth basketball experience for players, coaches and parents. Through a network of affiliated youth basketball organizations, live events and interactive experiences, the Jr. NBA will reach five million youth ages 6-14 in the U.S. and Canada over a two-year period as part of its expanded efforts launched in October 2015. The Jr. NBA partnership network is comprised of youth basketball programs of all NBA, WNBA and NBA Development League teams as well as elementary and middle schools, military installations and longstanding community partners, including Boys & Girls Clubs of America, Jewish Community Centers of North America, National Association of Police Athletic Leagues, National Recreation and Park Association, National Wheelchair Basketball Association, Special Olympics, and YMCA of the USA. Strategies for Youth is a national nonprofit organization dedicated to improving police/youth interactions and reducing disproportionate minority contact. SFY trains law enforcement in effective strategies for working with youth through the Policing the Teen Brain training for law enforcement. SFY teaches youth how to navigate interactions with peers and law enforcement through the Juvenile Justice Jeopardy game which helps youth understand the legal consequences of their behaviors and the short and long term consequences of arrests and court records on their educational and employment opportunities. SFY also conducts original research and policy reforms that promote a positive youth development approach in law enforcement.